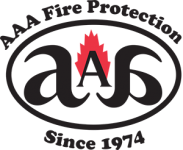 AAA Fire Protection Services is a family owned business that brings more than four decades of dedicated fire protection services to Milpitas and the South Bay Area. We provide quality and affordable fire extinguisher services that include annual fire extinguisher inspections, tagging, recharging as needed, and hydrostatic testing on a 5- to 12- year basis. We follow the California Code of Regulations - Title 8, Section 6151 to the letter, so your business is always in compliance with California's complex fire code. Our service teams are professionals and we offer expert services to every business that we partner with. Our goal is always to keep your business in compliance and to maintain that compliance through regular fire extinguisher services. If needed, we offer fire extinguisher sales. We run across many businesses that have the wrong types of fire extinguishers or they're the wrong size and therefore jeopardize the business's compliance with the California Code of Regulations. We would like to put our expertise to work for your company. We offer free quotes and answers to all of your questions. If you'd like more information, please give us a call at (800) 543-5556.